This ingenious lamp—ideal for your desk—turns on and off with the nudge of a magnet. No switch? No problem. 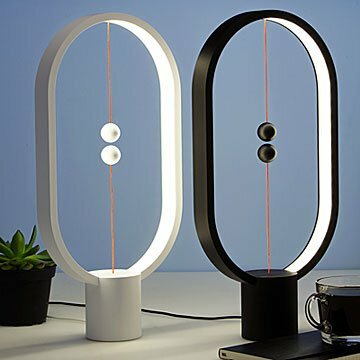 Li Zanwen's ingenious lamp turns on and off with a flick of the wrist... and the nudge of a little round magnet. Simply lift the lower sphere to switch the light on: It's attracted to the upper sphere and will stay put in midair, giving off the light you so crave. Once you're feeling like it's time to wind down, just lower the sphere and the light will turn off. It's that easy. And if this doesn't sound high-tech enough for you yet, consider this: It's powered by a standard USB. Hi, future. Made in China. Armed with a background in industrial design, maker Li Zanwen enjoys indulging in the unexpected. His designs focus not only on function, but on the lifestyle he imagines his customers lead—a way for his products to better fulfill their needs, he says. A winner of numerous scholarships and design competitions, Li was the proud recipient of a 2016 Red Dot Award for the Magnetic Balance Lamp design concept. In his own words, "imagination is the secret [to] a steady stream of inspiration." USB powered, use an adapter with a maximum output of 5V to power it. I love this lamp. I actually got mine when it was still a concept idea on kickstarter and so I paid alot less than it is on here, but I love it. Always a great conversation piece and puts off great light. Would buy again! Again, a unique product that is extremely overpriced. It's disappointing how the description of this being powered by USB chord has the tone of positive. I don't have a plug to spare, so now I need to purchase one before I can use this regularly. The light comes on more than when the magnets are connected. The overall lamp is made from a cheap platic. Would be worth the price if it was constructed with better materials. I'm beginning to think this website is just a bunch of unique cheap junk, which is disappointing. If you have an excessive amount of money you'd like to blow, go ahead and buy some. ALL THE OTHER KIDS WANT THIS. He loved the lamp and it was perfect for his home office. My 4 year old grandson thinks it's "super cool"! I'm thrilled to buy him something not typical that he loves!!! I loved this. I was nervous the light wouldn't be that bright which would make it a cool statue in the corner but it is bright enough for a reading light or to work at your desk in a home office at the end of the day.